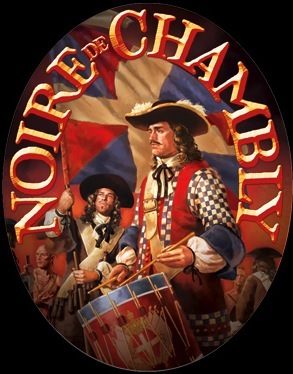 From Unibroue – This dark ale was created in honor of the brave soldiers of the Carignan-Salières Regiment, with their famous black musketeer hats. In 1665, King Louis XIV sent the regiment to New France to defend against the Iroquois. He had a number of strategic forts, including Fort Chambly, built along the Richelieu River, ensuring peace and prosperity for the colony. Many French Canadians are the direct descendants of these intrepid forebears. Unibroue – Unibroue Chambly de Noire – 12 oz. bottle, part of a Unibroue Sampler Pack – 6.2% abv. Appearance: Pours a cola brown with a thin tan ring of bubbles around the perimeter of the glass. Aroma: Cherry pie filling and spicy malt. Taste: Quick burst of tart cherry,light roast and bread crust, finishes with a tart twang. Mouthfeel: Very carbonated, medium bodied. Overall: I pick up a lot of cherry in this. Not in an obnoxious way either. Very drinkable.